(AINA) -- The Kurdish Democratic Party (PYD), a branch of Partiya Karkern Kurdistan (PKK), recently declared that they want to form a Kurdish autonomy in northern Syria. The area in Syria called al-Jazeera is now called Rojava in Kurdish media. At first I thought it was the name of a Kurdish village outside Qamishle, but a friend explained that Rojava means the "West" in Kurdish and the Kurds see it as the western part of "Kurdistan." 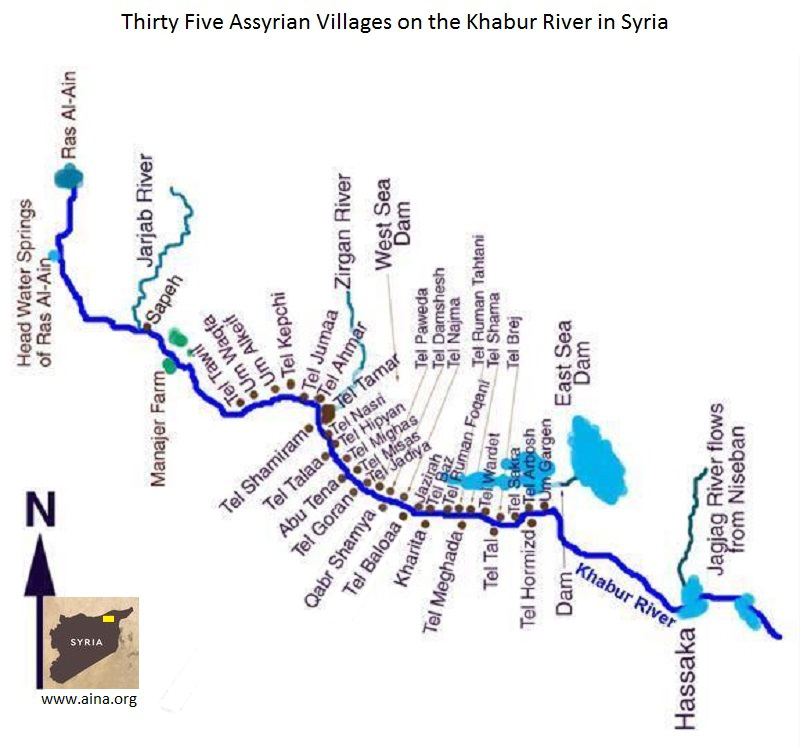 If such autonomy becomes a reality, is there any place for Assyrians? Is there room in a future ruled by Kurds, considering what happened in northern Iraq? Analysts I talked to are optimistic and see a difference from the Kurdistan Regional Government (KRG) in north Iraq. Assyrians make up about 30% of al-Jazeera's population and should have better conditions, they say. But the biggest threat to Assyrians is emigration, since many are fleeing to seek a better life in the West. The city of Qamishle, in northeast Syria, was formed shortly after the 1915 genocide of Assyrians by Turks and Kurds. My great-grandmother, who died in 1978, used to tell us that she had seen with her own eyes when Qamishle consisted of only three households, one of which belonged to our cousins, the Haddad family. The young brothers Yusuf and Davud Haddad were smiths who had survived the genocide. Their father Elyas, a member of Nisibins city council, was beheaded in 1915 along with his wife, family and other Assyrians in Nisibin. His children, two sons and a daughter, he had left in safe custody with an Arab family. These young people then built the third house in Qamishle in the 1920s. Assyrians who fled from Tur Abdin, Turkey after the genocide settled in Qamishle, which became a French mandate until 1946 when the Arab country of Syria was established. Qamishle in time became an important center of Assyrian culture. The Assyrians were the majority of the city's population, and put their stamp on it. When Egyptian President Jamal Abdel-Nasser visited Qamishle in the late 1950s, he said of the strong dominance of Assyrians in municipal administration "the only thing that is missed is a cross on the roof of the town hall. This is not an Arab municipality, but rather a church." Nasser visited Syria as President of both countries, after Syria and Egypt had formed a pan-Arab union that lasted from 1958 to 1961. After Nasser's visit systematic persecution of Assyrians began and forced many Assyrians to flee to Beirut. When civil war broke in Lebanon in 1975, they fled to Sweden and other Western countries. Arab nationalism increased in intensity and opposition voices were silenced effectively by the Baath regime after Hafez Assad took power in a military coup in the 1960s. Starting in the 1970s, Syria experienced a harsh dictatorship and became a police state. The Assyrians had no political rights but could practice their culture in the protection of their churches. Kurds had difficult times for long periods. They were seen as a common threat to all Middle East countries with Kurdish populations (Iraq, Syria, Turkey and Iran). The countries' policies towards the Kurds were often in agreement. As late as the 1980s it was forbidden for a Kurd to open a store in Qamishle. Those who did had to register with an Assyrian or Arab. Kurdish refugees from Turkey had no citizenship and lived with special restrictions. Then came the PKK guerrilla war against Turkey and Syria saw its chance to put themselves in the game by building bases for PKK on Lebanese territory. Lebanon was controlled by Hafez Assad at the time. But in 1999 Turkey threatened war if the PKK leader Abdullah calan was not extradited to Turkey. Assad drove calan from Lebanon. After some time in Greece, calan went to Kenya where he was arrested by Turkish agents. But calan continued control the PKK from prison and has been negotiating for some time with the Turkish government by proxy about a solution to the Kurdish question in Turkey. He also tries to play the Islamist card against the Sunni Islamist AKP government in Turkey. In his statement on the Kurdish New Year Newroz in March 2013, he described the relations between Kurds and Turks as "a thousand years of Sunni brotherhood." The revolt in Syria began spontaneously in the south of the country in March 2011, when some young people in the city of Daraa had scrawled on a wall that they wanted a change. The regime's hard-handed response led to a revolution where many opposition groups formed a common front and a political alternative to the Assad regime. The Assyrians were represented by the Assyrian Democratic Organization (ADO). But a year later the revolution was co-opted by different regional players who formed their own militias and killing gangs. These have put fear into the population through rarely seen barbarism. Nowadays, Syria is the scene of a war that no longer serves the Syrian population's interests. It is both regional players and great powers pulling the strings. This has led to chaos, where no one knows who is friend or foe. Various armed groups have crisscrossing unholy alliances. Turkey and Iran are said to be the main combatants, with their respective allies. Turkey is an ally of Saudi Arabia and the U.S., while Iran and Russia support Assad's regime. But even President Bashar Assad is said to have specific groups among the opposition who are terrorizing the population. The aim will be to show that Assad is the only option that can control Syria. His motto has always been "Bashar or chaos." The Kurds in Syria live mostly in the north along the border with Turkey. In al-Jazeera Province (Qamishle and Hassake) they constitute about 40 percent of the population. Unlike the Iraqi provinces of Erbil, Duhok and Sleimaniya, the Kurds in Syria are not a majority in al-Jazeera. Therefore, political observers believe that any Kurdish autonomy in Syria is less likely and not as easy as the KRG in Iraq. In addition, there is a internal power struggle between Masoud Barzani and Abdullah calan for control of Syria's Kurds, over natural resources and trade. Syria has rich oil resources in the city of Rmelan, a few mils east of Qamishle. There has not been a single attack there. It is said that the Assad regime, Kurdish PYD and Jabhat al-Nusra have an agreement to share oil revenues. A few months ago the Assad regime gave the administration of al-Jazeera to Kurdish PYD. Initially PYD began extorting Assyrian merchants, but now PYD has so much money from other activities, such as smuggling emigrants, they no longer engage in extortion of Assyrians. Most of those fleeing are Assyrians who purchase travel documents from PYD. The Kurdish party PYD thus earns big money by smuggling Assyrian people, while al-Jazeera becomes emptied of its indigenous people. It helps of course a future Kurdish government in the area even more, when the Assyrian voice becomes weaker. Assyrians have no armed militias. The only thing that exists is a self financed guard that protects the Assyrian neighborhoods in Qamishle and surrounding small towns. Assyrian political representatives are constantly mediating between conflicting parties (AINA 11-29-2012), such as PYD and Jabhat al-Nusra, to preserve the relative calm in al-Jazeera. The Assyrians have a joint council representing all factions of the people and all of its communities. This council finances the Assyrian guard. The Kurds have a national Kurdish council where various Kurdish interests are pulling in separate directions. Autonomy has not been officially demanded in the platforms representing the opposition, According to Assyrian representatives. Much of the talk seems to be for internal consumption, as part of the Kurdish-Kurdish power struggle between the KRG and the PKK. Turkish media also blows up the issue for their purposes. However, a Kurdish government could be realized when the war is over and when strong players like Barzani and Apo have agreed on its structure. If that happens, the question becomes what would be left for the Assyrian population in al-Jazeera?